FULL DAY OF DANCE©: 5 Amazing Classes!! TAKE ANY NUMBER OF CLASSES; MOST FUN & BEST DEAL IS TO TAKE THEM ALL! The day also features the Free Treat Tasting Fair, 2:30-3:30. Delectable tastes from outstanding restaurants and gourmet food sources. 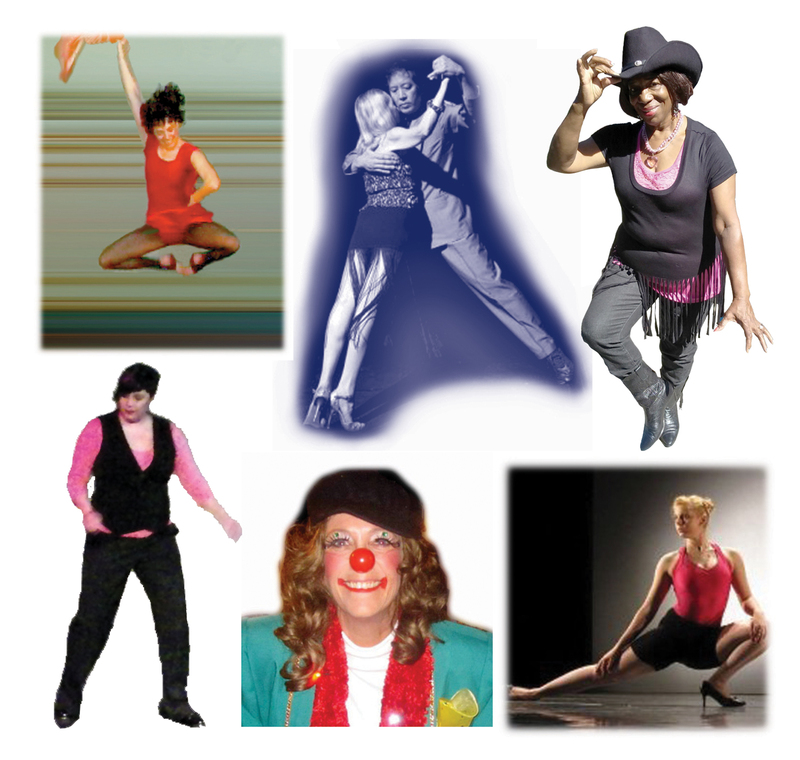 This entry was posted in INTERNATIONAL DANCE FESTIVAL-SILICON VALLEY and tagged Argentine Tango, Contemporary Dance, Etta's Electric Line Dances, Full Day of Dance, Jonathan y Olivia Argentine Tango Workshop, Line Dances, Mountain View Masonic Center, Pilates mat, Tap Dance on July 24, 2016 by Leslie. 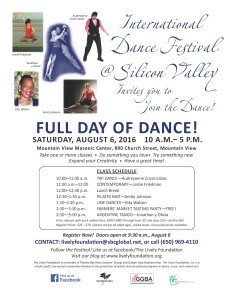 WELCOME to the 5th Anniversary Season of the International Dance Festival@Silicon Valley! 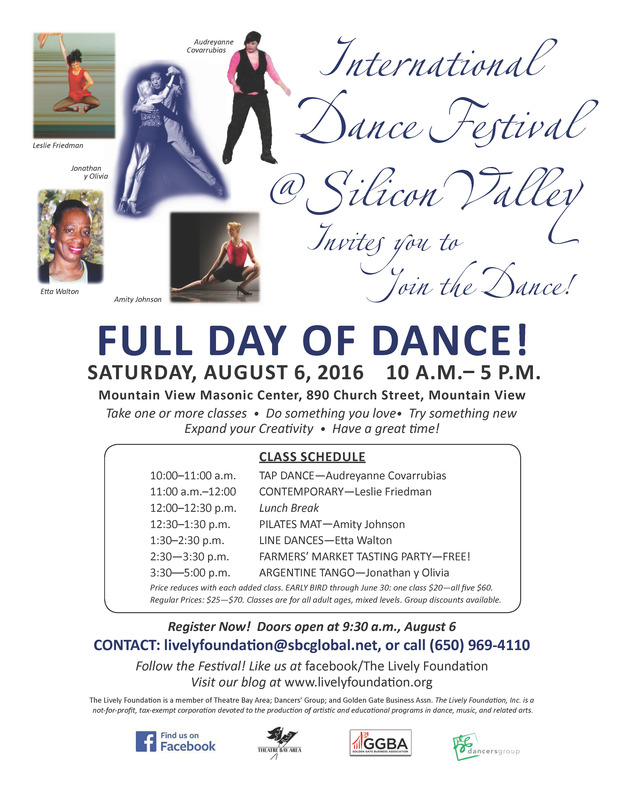 IDF@SV 2016 offers classes, workshops, performances. There are performance opportunities for experienced dancers, a chance to create your own dance and perform it, opportunities to try a dance style you’ve never tried before or even to try dancing if you’ve never tried it before. Our Festival Concert features exquisite dances by artists of classical Indian Bharatanatyam and Kathak, Tap Dance by Audreyanne Covarrubias & Megan Ivey, Contemporary ballet by Leslie Friedman, and a chance to join Etta Walton in her Electric Line Dances. The Festival welcomes advanced & professional dancers AND complete beginners, ages from mid-teens to any adult age. The Physical Comedy workshop welcomes ages 10 and up…and up! Here are the activities of IDF@SV 2016. To learn more about each part of the Festival, please click on its name to link to its page with specific information. This entry was posted in INTERNATIONAL DANCE FESTIVAL-SILICON VALLEY and tagged Amity Johnson, Antara Bhardwaj, Argentine Tango, Audreyanne Covarrubias, Audreyanne Delgado-Covarrubias Tap Dance Class, Bharatanatyam, Choreo-cubator©, Choreography workshop, Contemporary ballet, Contemporary Dance, Etta Walton, Etta Walton Line Dances, Festival Concert, Full Day of Dance, IDF@SV 2016, international dance festival@silicon valley, Jonathan y Olivia, Kathak, Leslie Friedman, Line Dances, Megan Ivey, Navia Natarajan, Physical Comedy workshop, Pilates mat on July 24, 2016 by Leslie.